Make restaurant quality butternut squash soup! Peel squash and dice into small uniform pieces. The smaller the dice, the quicker it will cook. In the end we will be blending the soup so they don’t have to be the prettiest cuts. The most important thing here is that they are uniform in size so they will cook at the same rate. 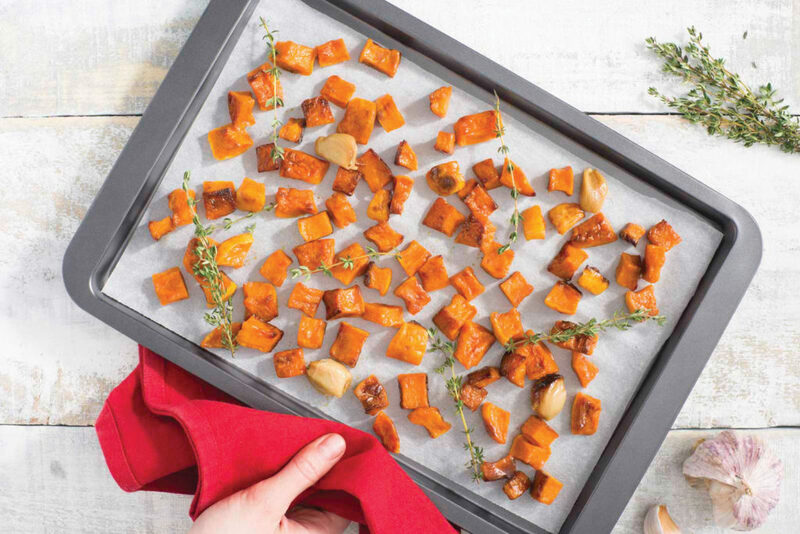 Toss the squash in a bit of olive oil and lay them on a lined bake sheet with cloves of garlic and fresh thyme. Dried thyme can be substituted, but fresh garlic is recommended. Roast the squash in a 400F oven until golden and tender. Next, place the roasted butternut squash in a saucepan. Add Campbell’s Thai Chicken Broth to cover the butternut squash, season with salt and pepper and simmer the soup until the squash is very soft and beginning to break down. It is important to simmer the soup at this point. If you boil it too much the broth will evaporate and you may end up with a very thick soup. Simmering is best, it allows the flavours to come together. as blending hot soup can be tricky! If you feel more comfortable and want to let the soup cool a bit before placing it in the blender it is probably not a bad idea! Place the squash in the blender and begin to puree. Add the broth in gradually until you reach your desired consistency. Check your seasoning and reheat to serve. Tip: A splash of cream or coconut milk is a great option if you like a creamier soup. Enjoy!